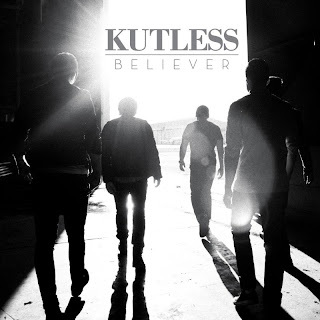 For various and sundry reasons, I didn't give this new release by Kutless a lot of attention in the lead-up to the album's release. I'm a bit hot and cold on Kutless - generally I like their stuff and I've even gone to see them in concert, but I enjoy their worship albums about a billion times more than their standard rock albums. I've long felt that Kutless would be better off just doing worship-oriented music - I mean, "What Faith Can Do" is a classic and it's truly one of my favorite songs ever. But then the folks at New Release Tuesday gave their new album, Believer, a five-star review and raved that it was the best thing these guys had ever done. And I tend to give the NRT guys a lot of respect. So over the weekend, I ... umm ... tracked down the album (it's all on YouTube) and gave it a digital spin. Gosh darn it, if the NRT folks weren't right. This album is AWESOME. Melodic, beautiful, sweet, honest, passionate, touching ... Believer is definitely the best collection of songs the band has put out. While some of the other reviews I've read have classified this as a "worship" album, I don't know if I'd go that far. It's definitely a worshipful album, parts of which that have very Top 40 pop/rock overtones. But this isn't your Chris Tomlin worship album. Heck, it's not even Kutless's It Is Well worship album. The lead single, "Carry Me To the Cross" is a lovely tune that sets the tone for the rest of the album. My favorite song is the title track, "Believer," which I think may actually be a better song than "What Faith Can Do" and I never thought that was possible. "Hero" is another great song, and one that I think we'll see on network TV soon playing behind the scene of a guy reaching out to hold a girl's hand after a tragedy. And the rockers all have a Switchfoot vibe to them, which is a good thing. Really, there's not a bad song on the album. And this all makes me happy because few things in life make me giddy with joy than tremendous new music and between this album, Worth Dying For's Live Riot and Starfield's The Kingdom the last few weeks have produced some absolutely fantastic tunes. Believer releases tomorrow. Get it.